Retail sales for pickup at the nursery only. Please call before coming to nursery to pick up palms. To obtain wholesale prices you must be in the nursery/landscape trade and have a state sales tax number and exemption form from your state on file with us to avoid paying NC state sales tax. Even though these palms are very cold hardy when mature, they can be very tender and subject to injury or death from freezing temperatures at a young age during their first year planted out from nursery grown containers. Seeds planted directly in the ground and not heavily forced result in more hardy palms when young. One to seven gallon palms should be afforded some protection for their first few years. For the best results, palms such as Trachycarpus should be grown to 15 gallon size before planting outside in areas that experience temperatures in the low teens or lower on a regular basis. Even this size would benefit from protection the first year in the ground in the event of mid to low teens and lower. Most of our palms are grown from seed collected from palm trees growing on our farm in Craven County NC that are survivors of severe cold. Most are grown in full sun with plenty of water and slow release fertilizer to create a compact crown and a thick trunk. Palms that are grown in shade are taller, but have a thinner trunk and very open crown. We do not use seed from Florida sources in our container production except for Sabal uresana. Please call before coming to the nursery to purchase palms. Some are limited as to how many can be purchased and sometimes an entire crop can be sold out on short notice. Palms that may be available at the nursery for retail sales. Call and ask for availability before coming to nursery. We will return your call as soon as possible. We appreciate your understanding. 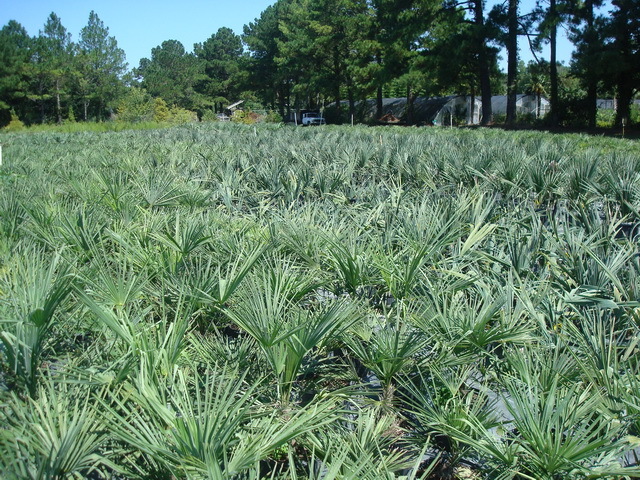 Sabal minor (Dwarf palmetto/Blue Stem palmetto)..................... We use seed from NC native plants only. Sabal minor is native to the southeastern US, including NC, and as far west as Arkansas, Texas and Oklahoma. Bush form, grows slowly to about 8-10 feet or so and eventually forms a short trunk after many years. In habitat it grows in partly shaded shaded wet areas but will tolerant full sun and after established is very drought tolerant. Very cold hardy after first year in the ground from nursery grown plants. Trachycarpus fortunei (Windmill palm)................. The most cold hardy tall trunking palm for inland areas. Leaf hardy to about 5 degrees when mature. These Windmills are grown from seed from old NC specimens that have endured many single digit and lower temperatures. We do not use Florida grown seedlings or seed. Small size plants need cold weather protection for the first few years. Trachycarpus fortunei- "Taylor Form" ( Windmill Palm ) Seedlings from offspring of the Trachycarpus that once grew on the Taylor property in Raleigh, NC. This palm reportedly lived for many years surviving many severe freezes. There are now many mature specimen offspring of this palm in Pullen and Jaycee Park in Raleigh which are survivors from the many that were originally planted there. The official low where these palms were growing was minus 8 degreees. Sabal palmetto "Bald Head Island" ................ Seed collected from Bald Head Island, NC in 2000. The most northern location of native Sabal palmetto. Butia ordorata (Pindo palm, Jelly palm, formally called Cocos australis and Butia capitata).... Borderline long term leaf hardy in open locations in the New Bern area. Probably should be rated zone 8b for long term survival here in the New Bern area. Butia should be planted in very protected areas and may need to be covered, etc. if extended temperatures below 12 degrees are forecast. However, they have recovered from low single digits with proper care after the damaging freeze. Large specimens recover very rapidly from cold damage. Sabal 'Birmingham'....... Very hardy. Should be good for some zone 7 areas in the south. Direct offspring from an unknown Sabal that lived through many cold winters in Birmingham, Alabama, including the severe freeze of 1962. The mother plant of these palms is a seedling from the original "Birmingham' Sabal that is one of four mature ones growing here at the nursery. Click to here see history and photos of Sabal 'Birmingham'. 3 gal. Very limited suppy. Rhapidophyllum hystrix (Needle palm)......... The most cold hardy palm. Bush form to about 10 feet. Can tolerate wet feet, full sun or part shade. Can benefit from some cold weather protection for first winter or so as the new emerging spear can be tender when plants are young and nursery grown, but after established is cold hardy to well below zero. Sabal Brazoriensis Hybrid btween Sabal minor and Sabal palmetto. Trunk forming Sabal that so far has been leaf hardy to 10 degrees. here in the New Bern area. The leaves are a beautiful blue-green. Some leaves are palmate while others are heavily costapalmate. In habitat this palm grows in moist soil but will grow in most soils as long as nutrients and water are adequate. Other palms are sometimes available in various sizes. NC Grown cold hardy palms. Grown from seed right here in Craven County, NC from old specimens some of which have survived below zero temperatures. Our Sabal palmetto and Sabal minor palms are grown from seed collected from native populations in NC. Hours sometimes vary so please call first.